The Ohio Nature Blog: Dragon Season is Here! For those of you that have been with me for a while, you'll remember back to the days when it was just Megan and I and we rented a home only a stone's throw from the Olentangy River. 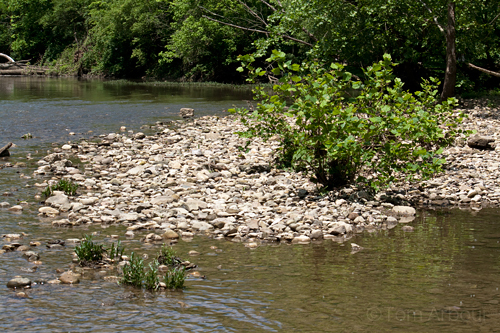 On the banks of the Olentangy, I found a passion in dragonflies and damselflies, and spent most of my free time photographing them during the summers of 2007 and 2008. I documented around two dozen species of Odonata, including three species that had never been seen before in Franklin County. All of these sightings happened in the middle of the city of Columbus, and a few surprised quite a few in the local Odonata community. Now that we've moved, I'm not far from the river, only about a five minute bike ride or so, but it feels miles away. The distance makes a big difference, and, it's just not the same river. Here in Worthington the river has been channelized, and the habitat just isn't the same as it is a few miles downstream. Sunday morning Megan, Weston and I went to Inniswood Metrogardens. 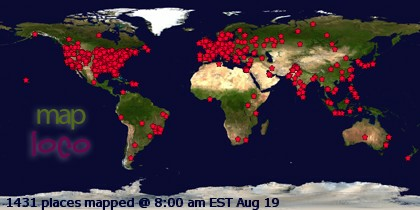 Dragons were flying, and it was hot and sultry by 11:00 am. With the dragons flying I thought to myself, why not head back to my old stomping grounds in the afternoon? 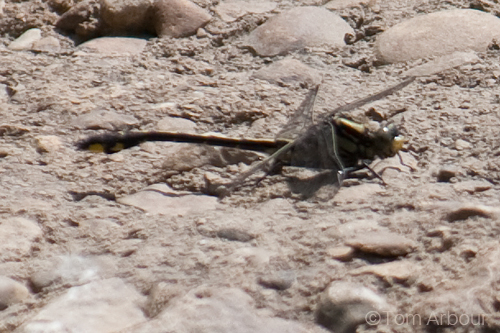 Maybe I could find a few early emerging dragonflies, maybe even a clubtail, one of my favorite groups of dragons. I packed up my gear, drove to Kenney Park, and walked down to the river. I chose an entry point at the northern end of the park. I waded into the cold water, the river was high and moving fast- few rocks were exposed, but just enough for clubtail perches. I watched for dragons, and it didn't take long to find exactly what I was looking for. 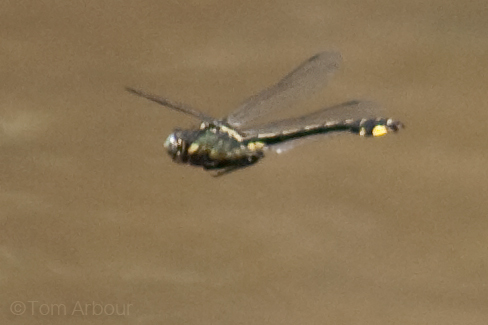 A dark, clubtail-tipped dragon cruising about two feet off the water upstream. My hunch had paid off, the dragons were flying- now I had to photograph them. 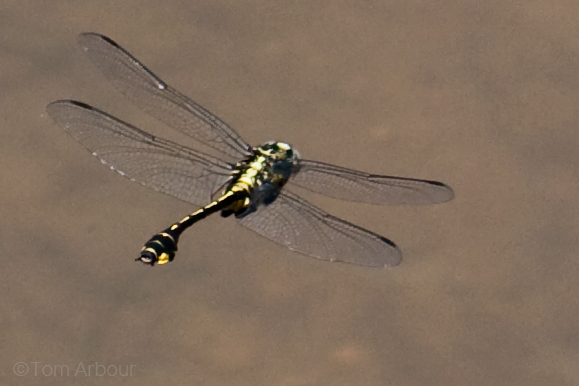 To photograph dragonflies, I use shutter priority mode on my camera- This allows me to set a super high shutter speed to stop motion. If I set the camera to ISO 400, there's enough light on a sunny day to use 1/1000 of a second. This pretty much freezes the dragonflies in flight. Focus is the next problem- sometime I use autofocus, setting the camera in Canon's ai-servo mode, and sometimes I just use manual focus. I typically end up cropping the images quite a bit. I use a telephoto zoom lens, and I've found that a 200mm focal length is about all you can use- anything longer than that and your chances of following the dragon through the viewfinder are pretty much nil! So, what do we have here? I think it could be a midland clubtail, judging by its color, the shape of the later abdominal spots, and the arrow-like patterns on the dorsal (top) of the abdomen. This would make another new species for me on the Olentangy! With the warm weather in Ohio this week, dragons will be flying everywhere. Get out your camera, binoculars, or a net and have fun! Great photos--I must try that sometime on my camera. Hey Tom- AMAZING shot! Sure wish I could do that! Try the Plains Clubtail (just an educated guess..) It is a little early for Midlands- and the right time for Plains. Cheryl- Thank you- According to the Ohio odes website, mid-may is the start of the flying time for the midland clubtail. I think the lateral abdominal spots are different in the plains clubtail- which has three yellow spots- this one only has two. If it is a plains clubtail, it would be another county record. Only more photos and/or a specimen (I usually just take photos) would firm up the ID. Down by the marshes at sunset the dragons congregate by the thousands. How they don't bang into me or each other I'll never know!